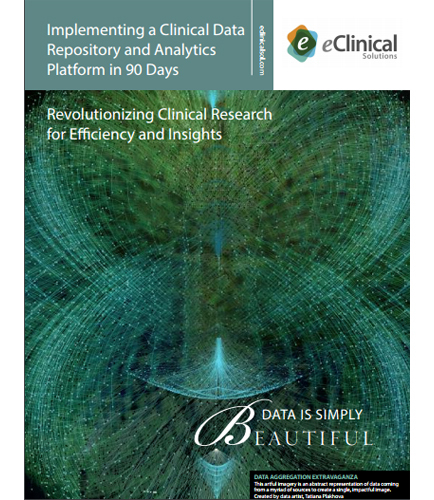 "Implementing a Clinical Data Repository and Analytics Platform"
What is the need of having a Clinical Data Repository and Analytics solution? Well, implementing a Clinical Data Repository (CDR) within a meaningful timeframe and a reasonable budget does not have to be a major IT initiative. With the right technology partner, a CDR can be implemented in 90 days. The capabilities are growing quickly and robust CDRs are available that allow companies to reap considerable value from clinical trial data. How to maximize and utilize all clinical and operational data for real-time healthcare analytics? What are the critical components in successfully implementing the CDR platform? What are the technology benefits of implementing a next generation CDR?